Rarely do we think back to our Baptism. At the Easter Vigil the Church offers us the opportunity to renew baptismal promises made on our behalf long ago by the parents who first accompanied us to the font of rebirth. We do so and are sprinkled with newly blessed Easter water. The heavens rain graces upon us. Showered, we emerge from churches as springs of life, made clean. It all began in the Jordan with the Baptism John was preaching. Christ walks up to him and asks to be baptized. The heavens were opened, they were parted, and the Father’s will is revealed in the advent of the Son. Here the public manifestation of Christ’s mission on earth begins. Like Noah rising from the flood and the people of Israel passing through the waters on their final pilgrimage into to the Promised Land, the Son of God now emerges from the Jordan and commences the redemptive work of the Father. Always, in a litany of water washings, the people emerge, showered. It is a wave of souls that counts Christ in its company. He, supreme among them, innocent, is baptized so to imbue grace in the fonts of life that regenerate the children of God. 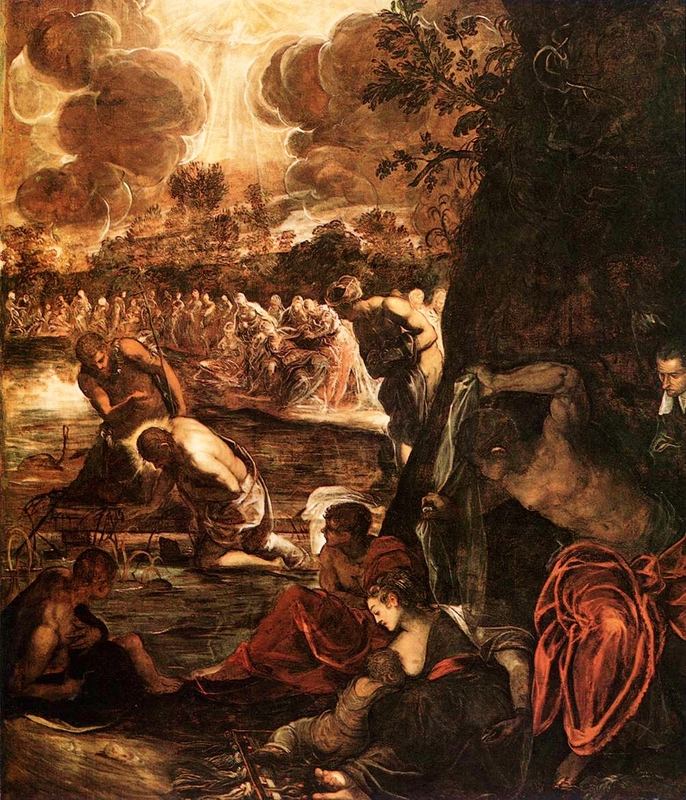 The Jordan becomes the river of the baptized — its banks a temple gate. From it the Life of the World rises forth, whose command to the disciples then on rising from the dead leaves us heirs to the graces of his Baptism. They stood there, silently, in front of an altar. In the back some priests were hearing confessions. Hesitant, I approach one, whose final words to me were ‘Daughter, remember the graces of your Baptism’. Why remember? I asked myself. Two years have passed, and I have not forgotten. Still to this day the words come back. They come back when the skyline darkens and the rains pour down. They come back when someone else is baptized at the gates of modern temples. They come back whenever I approach the God of mercy in confession. At the time they made no sense to me, and yet they continue to reveal. No longer taken for granted, one knows in hindsight that what begins on the day we are baptized remains an unfolding tale of grace. Decades pass and yet the promise remains. Beloved, we are not forgotten; our names, given in the bath of sacred waters, are written in the heart of God. We become and remain claimed by God. A divine filiation emerges possible. We are the desired children of the Father. I have seen waters – waters of stormy seas and stunning cascades rolling down vertiginous cliffs. I have tasted waters that refresh raging thirst and quench the longing sighs of laboring climbs. I have nearly drowned, and the child I once was has been saved from the depths of ocean waters. I have seen seas of white snow and been lost in the cold wastelands of frozen space. Water is powerful; bigger than we are, deeper, all enveloping. It is a precious natural good in the world; its purity, the life source of human existence. Without it we would wither and die. And yet, for all the abundance of life it begets and sustains, water is not enough. I see water, which I have been used to see every day. Is that water to cleanse me now in which I have so often bathed without ever being cleansed? By this you may recognize that water does not cleanse without the Spirit. Among the rivers of the world, physical life remains in life. It is the river of grace, imbued with the Spirit, that sustains the life of souls into eternity. No longer can we think ourselves simply pilgrims on a road to nowhere. Anointed, we are called back to the house of the Father. Among the nations his voice is heard in words we speak. Coming forth from our mouths is the life of One who rose out from the waters, and was exalted on the Cross: the beloved Son of God who then would rise from the dead and lives. Such is the glory of Baptism. The voice of the Father resounds still in hearts that enshrine the Son, incarnate. A royal priesthood, a holy people is born. ‘Remember the graces of your Baptism’ — graces operating in a broken world, building on wounded nature, healing, perfecting it. Like currents over polished stones in the river bed, I have seen waters cleanse and restore the luster of mired hearts. I have seen waters, sacred pourings, descend, revive; cascades of grace enlivening the darkness and pangs of thirst. I have seen sacred waters wash the newborn and bless the bodies of the dearest dead. And then I remembered. For in the severance of a later separation I have desired sacred fonts of grace for the lives of those lost in hidden deaths — children whose vocation remains hidden in the heart of God, are now enveloped in the baptism of desire. Those graces of my Baptism are now desired for one whose head was never anointed with sacred chrism or body bathed in the pure waters of rebirth. Remembering would then make sense. We want for the fruit of our womb the best of what we ourselves possess. Privilege assumed on — the privilege of rebirth from the stain of sin — becomes the single hope of hearts for life that lasts beyond the vale of tears and pangs of death. I would beg that this child of mine be born a child in the life of God. The graces of my Baptism are remembered, and flowing still. A new gratitude emerges in the rivers of the soul. I have seen waters — portal to glory and the grace of life eternal. From the Cross, from the lifeless body of the One who made the Jordan a river of grace, twin streams of life flow still. Blood, water — sacred blood and sacred water — are now font of life. Mercy is offered and lavished. The waters flow from His Cross onto an altar and into a nave for souls that seek a living spring to quench their thirsting hearts. Among the modern pathways of the world, still, the Christ anoints the waters of redemption. I have seen waters — cascading waters of hidden and superabundant grace. Saving waters, made new by the Innocent One, newly bathing the innocents. Saving graces of my Baptism, remembered.